For Publicist Marvin Levy, It's All About Eyeballs A publicist is responsible for making a movie known — in a good way, with any luck. It's a multifaceted job, but what does he or she really do? NPR's Susan Stamberg continues her annual Hollywood Jobs series with a story of one prolific publicist and the director he serves. Veteran publicist Marvin Levy in his office at DreamWorks Studios on the Universal lot in Los Angeles. Steven Spielberg's film Lincoln has earned 12 Academy Award nominations, including best picture and best director. Another Spielberg film — the multi-Oscar winning Schindler's List — will be celebrating 20 years since its release. These films have at least two important things in common: Spielberg and publicist Marvin Levy. Levy started his career in New York writing questions for quiz shows. He wound up in publicity for MGM radio and TV personalities, but was lured to Hollywood in the mid-1970s. He took a job with Columbia Pictures and was later assigned to do publicity for the 1977 film Close Encounters of the Third Kind, written and directed by Steven Spielberg. That began an almost 40-year relationship with the filmmaker. Levy's office is in the back section of the Universal Studio lot, an area inhabited by DreamWorks Studios, the company Spielberg helped found. Adobe buildings were fabricated for the filmmaker to echo a southwestern motif because Spielberg grew up in Scottsdale, Ariz. This was a thank you from Universal, which financed and distributed Spielberg's 1982 megahit, E.T. Marvin Levy is 80-something, small and peppy in a blue jacket, jaunty baseball cap and black-framed glasses. And he's still going strong. On this day, Levy is meeting with Universal Home Video publicists and a representative from the USC Shoah Foundation about the 20th-anniversary marketing campaign for Schindler's List. Spielberg won Oscars for best director and best picture for his 1993 film. Levy is overall coordinator for the anniversary campaign, which includes the re-mastering of the film on Blu-ray and a push for an education program that engages middle- and high-school students in the history of the Holocaust. On any project, Levy knows he is the carrier of the mission statement. He upholds Spielberg's vision and keeps the pitches and promotions consistent. That's the marketer's job — although, Levy has a punchier definition. "It's all about eyeballs," he says — getting people to see a film, whether it's in seats at a theater or on a sofa at home. And these days, he points out, "they could be standing up with some device in their hand." Wherever they're watching, the publicist needs to craft a pitch that will lure an audience. Not an easy task. And veteran Levy is a realist. He knows that pitching films is an imprecise science. Some films don't get the marketing campaign right the first time. His example is the 1973 film Walking Tall. He wasn't working with Spielberg then. He was with the Cinerama Co.
"Walking Tall, a true story about a Southern sheriff, Buford Pusser," Levy says. "A name not easy to forget." The first ads for the film highlighted the violence. "He was the fighting sheriff," Levy recalls. "It opened, didn't do much. Everybody went back to the drawing board and came up with another campaign." They realized that the movie also had a poignant story line about Pusser's wife and family. "That part of the story really resonated," says Levy. A new poster played down the action. It showed Pusser and his wife and just the holster of the sheriff's gun. It worked. The film went back into release and was so successful — especially throughout the South — that theaters had to hold it over for weeks and weeks. Decades later, Levy is still tackling pitching issues — this time as part of the immense team that put together Spielberg's big, but challenging, new history film about Abraham Lincoln. But how do you market a movie about a president who lived long ago, wears funny clothes, is not particularly handsome and is trying to railroad a really hard-to-understand and not very popular amendment through the Congress of the United States? Levy's answer? "You have to say: 'What are the elements that make it so an audience might want to see it?' "
We all know Lincoln, says Levy. He's a part of our American psyche. "But what we really know is very little," Levy says. So his job is to make it clear the audience will see a Lincoln they haven't seen before. Two decades ago, Steven Spielberg showed audiences a hero they really hadn't seen before: Oskar Schindler. And it's hard to believe it's been that long since Schindler's List. But Levy remembers. 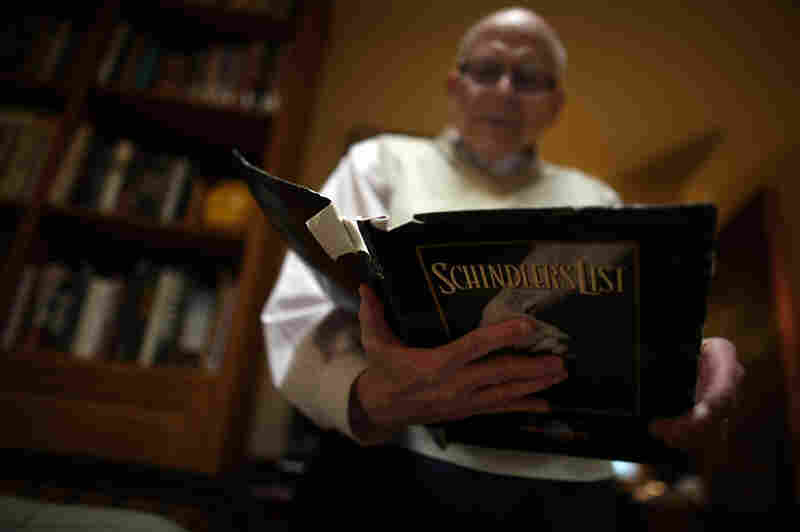 Spielberg's Schindler's List will mark its 20th year in 2013. Levy was in charge of the publicity campaign for the film and still has his original press kit. He pulls out a tattered folder — the original press kit — filled with black-and-white photos and pages of press material. "Oskar Schindler was a man of great talents and even greater contradictions. A born salesman, an inveterate gambler. 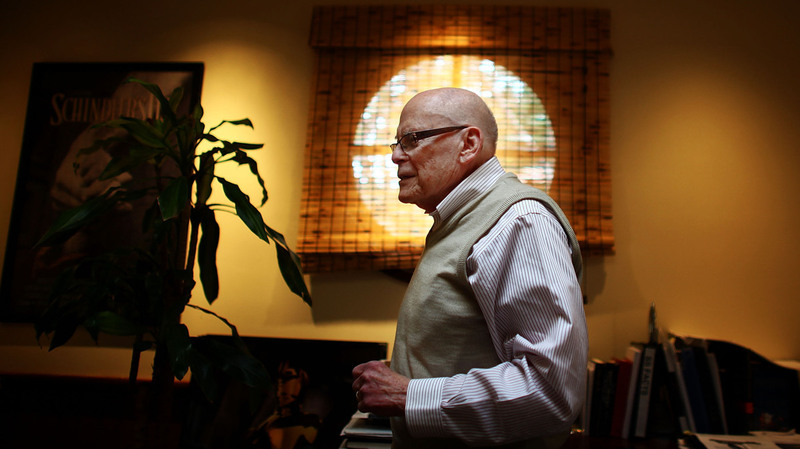 He sought his fortune in the aftermath of the German invasion of Poland. Like many an enterprising businessman, he joined the Nazi Party to make deals. But he was himself indifferent to politics. The only thing he truly believed in was enjoying life to the fullest." "His conscience gave him little trouble, at first." But would that wording hold up today? Maybe it would need faster bulletins, such as: He was a big businessman, he was a ruthless merchant, he was a Nazi. And yet, he saved more than 1,000 Jews. "No. It would not have been true to the film. That would work for some other movie. Not for this one," he says emphatically. "That sounds too much like another one of those action movies. This is nothing like it. This is a movie about humanity. You can't get away from it. Once you do, you're putting out the absolutely wrong message." And finally, is there a movie Levy didn't get to do and wish he had? "Probably something like Bridge on the River Kwai or Lawrence of Arabia, a big epic," he says without hesitation. "Or the great big musicals — I mean, to have spent every day on Singin' in the Rain, with all those people around? I'd have loved every minute of it." One thing about Hollywood: You meet a lot of people who are crazy about movies. Marvin Levy, clearly, is one of them. The Hollywood Jobs series is produced by Cindy Carpien and the NPR Multimedia team.